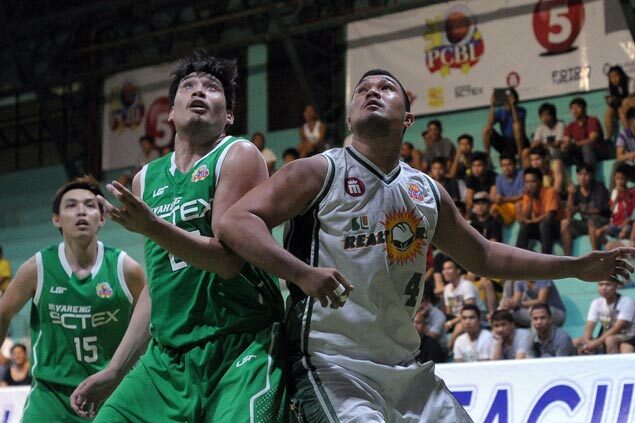 SCTEX's Raul Soyud battles Sta. Lucia's Wowie Escosio for a rebound. FORMER pros Lester Alvarez and Jopher Custodio led the way as Euro Med beat Foton, 77-73, in the opener of the quarterfinals of the PCBL Chairman’s Cup on Friday at the Marikina Sports Center. Biyaheng SCTEX edged an import-less Sta. Lucia Realty, 77-72, in overtime in the other game. Alvarez, a former player for San Mig Coffee, scored back-to-back baskets, giving Euro-Med a 75-71 lead with 1:16 left. Levi Hernandez scored with 21 seconds left then Cedrick Ablaza was forced to give up a foul on Custodio. Custodio, who played for GlobalPort in the pro league, made his first free throw, but muffed the second, allowing the Toplander a chance to come up with a final offensive play. Mikee Reyes missed a potential game-tying triple with no time left. SCTEX used an 18-6 spurt to move within six points, 53-47, in the third. Jhaps Bautista put the Realtors ahead, 62-60, with a basket, 32 seconds in regulation before Soyud responded at the other end with a getaway layup and sent the match to overtime. SCTEX 77 – Villarias 19, Soyud 19, Batino 14, Raymundo 10, Sumalinog 5, Pangilinan 5, Okomo 3, Vitug 2, Del Rosario 0, Reyes 0. Sta. Lucia 72 – Jamito 13, Bautista 12, Camasura 12, Salado 10, Bangga 8, Vidal 8, Javelona 5, Escosio 2, Ilagan 2, Castanarez 0. Euro-Med 77 – Adeogun 20, Alvarez 16, Poligrates 14, Parala 11, Custodio 8, Almario 2, Capacio 2, Almario 2, Salamat 2, Salcedo 0, Gil 0, Galanza 0. Foton 73 – Gomez 23, Hernandez 14, Reyes 13, Rivera 11, Ablaza 5, Ouattara 5, Nacpil 2, Enriquez 0. Quarterscores: 14-16; 33-36; 53-50; 77-73.